Over 100 fire officials responded to several brush fires burning along the Byron Highway in East Alameda County Wednesday afternoon. Mountain House Road to West Grant Line Road closed due to at least seven vegetation fires scorching the terrain, according to officials. The fires, which have torched about 500 acres, were 35 percent contained as of Wednesday night. Aerial footage showed burnt structures in the middle of a field. Officials said the structures are not homes but it wasn't immediately clear what type of buildings were burned. "Due to the whipping winds, we’re seeing several small fires spotting in fields across Byron Highway," the Byron-Bethany Irrigation District said on Twitter. Fire officials are responding several brush fires burning along the Byron Highway in East Alameda County Wednesday afternoon. Melissa Colorado reports. 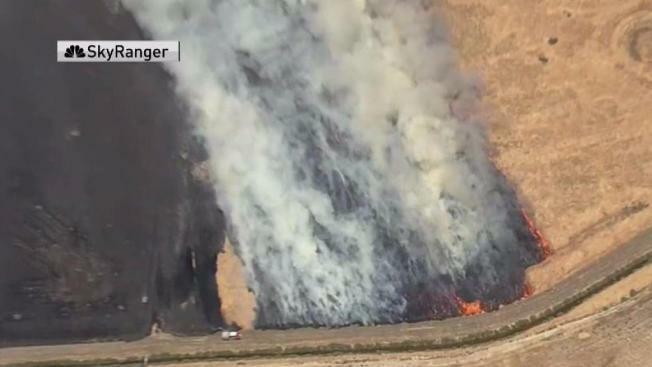 Officials said the 40 to 50 miles per hour wind is making the fire harder to contain. East Contra Costa County Fire Protection District said "everyone" was dispatched to the scene. CAL Fire officials were flying a helicopter over the area, "performing water drops," the Irrigation District said. No cause or other information were available.